T-Mobile replaces phones with refurbished phones. They misrepresent what they are doing. T-Mobile is fraudulently providing customers whose phones have malfunctioned with other phones that have previously malfunctioned – in other words, they are sending refurbished phones rather than new phones as replacements. These refurbished phones are some of the same ones that have been malfunctioning, or they are knockoffs from Asia. And T-Mobile claims they don’t have control over this process. Unbelievable. The promo for tonight’s Monday Night Football game between the Denver Broncos and Oakland Raiders features the hard rock classic “Tom Sawyer” by Rush. It works really well and it’s great to see ESPN using it, because they usually only play more recent songs, softer songs, or country songs. This song in my opinion is the greatest rock song of all time. It starts with the beginning of the song with the camera showing Manning walking from the locker room to the field. The lyrics actually sound like “A Monday Warrior” when Geddy Lee sings it. It’s great because Manning is stepping into a throw when you hear “mean, mean stride.” The “mean, mean pride” part also fits well. It starts with the beginning of the song and then they cut up a few of the parts. Awesome. Rush is one of the best bands of all time, and they’ve been doing it for 40 years with the same lineup (after drummer John Rutsey was replaced by Neil Peart in 1974). The Philadelphia Eagles have gotten off to a 10-7 lead against the Washington Redskins at FedEx Field in Landover, Maryland. The game marks the return of Robert Griffin III to the field after last January’s ACL tear in a playoff loss to Seattle. For Philadelphia, Chip Kelly is coaching in his first NFL game and Michael Vick is hoping for a comeback season in Kelly’s uptempo offense. The Eagles marched down the field but, deep in Redskins territory, Vick threw a sideways pass that the referees called a lateral, and DeAngelo Hall returned the fumble (actually broken up in the air by Ryan Kerrigan) for a touchdown. RGIII just threw an interception. He looked tentative and threw it into double coverage. Alfred Morris has fumbled twice, and the second one led to a safety. It’s Philly 12, Washington 7. Of the last 10 NFL teams to finish 10-6 after a losing season, only one of them (the 2006 Kansas City Chiefs) followed up their 10-6 year with a winning season. 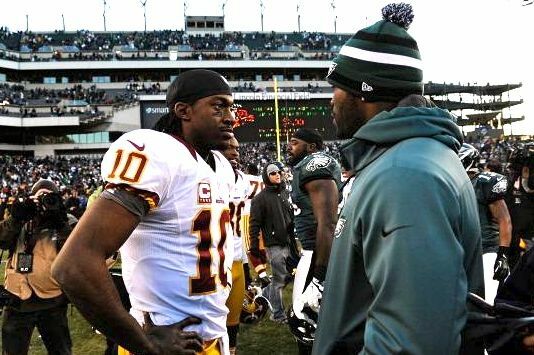 Click here to read my most recent article about RGIII and the Redskins (http://bleacherreport.com/articles/1767742-robert-griffin-iii-washington-redskins-must-buck-history-to-make-playoffs-again).